Later on there was a despotic religion that annihilated everything else, destroyed age old cultures and beliefs, and surpressed natural wisdom and science. Then, the world was provided with perverted rags like Dantes' 'Divine Comedy', while everything scientific landed in the fire. But for all the 'evil' there was a perfect scapegoat - the devil.. In the Tree of Life the Devil goes from consciousness and harmony to intellect and logic - against all dogma, never caring for rules, freely uncompromising and independent. There are no restrictions, no limitations, nothing is forbidden. The Devil is aware of the darkness, he knows all the shadows and will go on researching even at a high price. In a positive aspect, the Devil tells us to go ahead with whatever we want, even when the results won't be comfortable. Never forget that half of the great scientists in history ended up on a scaffold or were accused of 'heresy'. 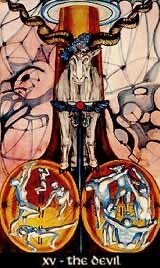 Therefore, the negative aspect of the card can mean loneliness, misunderstanding, or that someone is outcast and damned. On the other hand of course, it could mean that applying a little restriction here and there wouldn't have been the worst solution. By the way, I don't mean that you should see the Devil as a person, or take the plain image of someone with horns and hoof seriously. The little paragraph above is just to help you to see and use the powerful potential of trump XV in its intended manner. Light: Independence, wilfulness, never accepting dogma, never bowing the head - 'Non servam': I don't serve!